Our final day in Paris and we had nothing planned other than a river tour. We headed out of the hotel around 11 and made our way to Pont de l'Alma where the boat tour casts off. The tour took us from the Eiffel Tower down river, passing under every bridge and passed every riverside landmark right down beyond Notre Dame and back. Fortunately we had the best weather out of the whole week so we were able to sit out on the boat deck and take in the sun as well as the sights. After the boat tour, we decided to take advantage of the lovely weather to take a stroll through the Tuileries Gardens, something we planned to do on Wednesday but was scuppered by the heavy rain. Before we got there, we went on a hunt for a chocolate shop called Godiva. We'd seen it featured in 360 Paris by Nick Wood and thought it'd be a nice treat for us to take home some nice chocolates. The search took us passed Place da la Concorde and into an area that can only be described as fashionable. I felt suitably under-dressed to be walking amongst people who were dressed head to toe in designer clothes. Anyway, we found the shop and bought some nice chocolates and went on our way. We stopped for lunch in the Tuileries Gardens at a nice little place with tables set outdoors. Here I discovered a hotdog with melted cheese made a rather nice meal. After lunch we found the metro and headed to the Latin quarter, home to the Panthéon which was our final landmark visit of the trip. Outside, the building has a very Greek influence with huge columns marking the entrance and once inside you find it more Roman in its architecture but the main thing you notice is the vastness of the space. Interior columns lead your eyes up to the amazing domed ceilings and as you pass though the place, you see a number of huge murals and sculptures. At the rear of the building, you're able to walk down into the crypt which houses many well known names such as Voltaire, Marie and Pierre Curie and Alexandre Dumas. 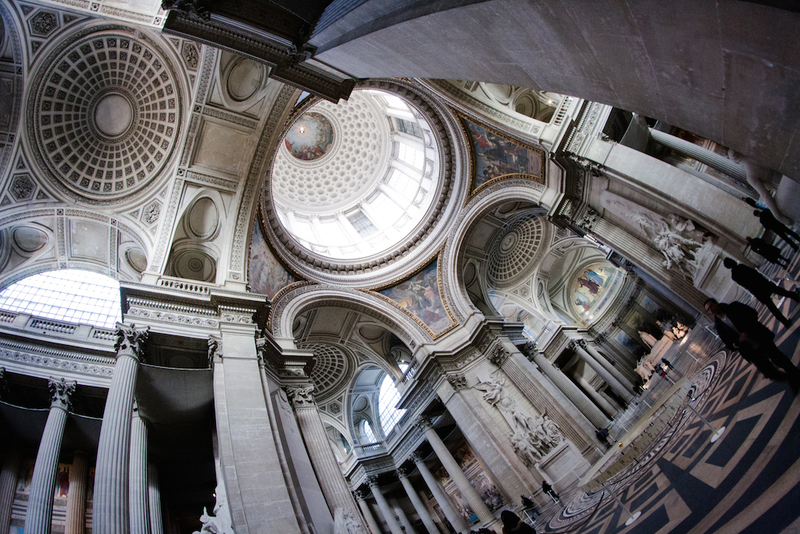 By the time we'd finished walking around the Panthéon, we decided to call it a day stopping at a small bakery along the way to pick up some pastries and treats and spent the evening relaxing in our hotel. The journey home on the Saturday was uneventful really so there is little to write about. We marked our first night back in England with chicken kebabs from the best kebab house in Kent.